July 1, 1839. . . It’s a great sight to see a large train get under way. I know of nothing that would more strongly impress our great-greatgrandfathers with an idea of their descendants’ progress in science. As to the engine, the most pithy and expressive epithet I ever heard applied to it is “Hell-in-Harness.” Just imagine such a concern rushing unexpectedly by a stranger to the invention on a dark night, whizzing and rattling and panting, with its fiery furnace gleaming in front, its chimney vomiting the body and tail of a gigantic dragon—or like the d—l himself—and all darting forward at the rate of twenty miles an hour. Whew! February 22, 1840. . . 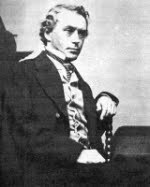 Went up to the Hall after tea with George Anthon to hear Bidwell’s lecture before the Law Association on “Marriage.” He recommended all the association to try it for themselves: “the most interesting trial in which they would probably ever be engaged.” Hum. Doubtless to get a first-rate wife must be a very fine thing, but the chances are rather against such a desirable result, and what a horrible business it must be to find oneself mistaken. . . .
August 3, 1843. Very tolerable weather for the season. Mustn’t encourage a querulous temper, but I should like it better still if there weren’t so many mosquitoes. Verily I believe that the King of the Gallinippers held his court in my room last night. They’re such a sagacious animal that there’s no circumventing them. It’s utterly visionary to think of seducing them into this room out of mine by opening the door and calling their attention to the light They argue that somebody must probably sleep in a room with a bed in it and conclude to wait for their supper and take it in a comfortable way. Then they see in the dark, confound ‘em, well enough to dodge all hostile demonstrations at least, for I don’t believe there’s a case on record of a man having hit one of them after the candle’s blown out, unless he waited till the brute’s suction pump was two inches deep in his cellular tissue, so as to operate as a detainer. , . .
December 29, 1842 . . . there was a great fire burning downtown, and never was anything more splendid than the effect it produced. The whole sky was lit up with a bright soft crimson glow, almost of uniform brilliancy. The snow reflected it and back—streets and roofs were all tinted with the same color. It had a most magnificent and unearthly appearance. I was told the fire was in Wall Street, and started off on a run, expecting to find the office on fire . . . Found that the fire was on Water Street, five or six stores blazing, and a fine sight it was. It was the worst fire we’ve had for a long time. The walls kept each other up for some time but at last one gave way, and then four or five large stores came thundering down with a prolonged roar that seemed to shake the ground, and the change from the blaze and brightness of active conflagration to smothering smoke and comparative darkness, only lit up by a perfect hailstorm of sparks and cinders, and then to see great masses of thick smoke light up as the flames rose again among the ruins and eddy round and sweep off before the northeast wind till the glare of the burning buildings was fully displayed again, was very fine. August 11, 1846. . . We had a thundershower and squall last evening that blew off a cat’s tail—that is, my unfortunate black and white friend was trotting in at the door to get out of the rain when a gust whisked the door suddenly shut and slammed off about three inches of Puss’s finale. Mercy on us, how she ran! April 18, 1857 Heaven be praised for all its mercies. The legislature of the state of New York has adjourned. That gang disbanded itself at 10:30 this morning, and every honest man in the state breathed more freely when he heard the news.